Dog Bite Scar Injuries and Recoveries | Hupy and Abraham, S.C. The dog that bit you left a lasting reminder of your dog bite injury. Your skin is now scarred and it is affecting you in ways that you couldn’t have imagined were possible prior to your dog bite incident. The extent of your injury will depend on how deep the bite was, where on your body the scar was, and how well you heal from the injury. Disfiguring. Your appearance may be permanently changed by the scar and may affect you physically and psychologically. Disabling. A scar on your hand, foot, or other part of your body may prevent you from doing the things you once enjoyed or from working in the job that you once held. Painful. The wound will be painful in the beginning. However, scarring may extend the pain indefinitely. You may be disfigured, you may be disabled, and you may be in pain, but you are not helpless. Instead, you may be able to recover even if you have a dog bite scar. The first step in your recovery involves contacting a doctor. You may be a candidate for reconstructive surgery or other medical interventions that can help lessen the effect of the scar on your body and on your future. Your goal may be to eliminate the scar or lessen its severity. Skin grafts. A skin graft is a type of surgery that transplants the skin from one part of the body to another. Skin grafts are often used for extensive dog bite scars that cover a large portion of the victim’s skin or scars that are in exposed areas, such as facial scars. Dermabrasion. Dermabrasion is a form of surgery that involves surgical skin planning, or shaving off upper layers of a scar. It is generally performed in a medical facility by a dermatologist or plastic surgeon. Laser surgery. Laser is a common form of surgery that a dog victim may undergo in order to repair smaller scars. There are different forms of laser surgery a dog bite victim may undergo, depending on the severity of the scar. As your external injuries begin to heal, you may find that you are left with significant psychological injuries. Many dog bite victims feel angry about the dog attack. They may also experience depression, anxiety, nightmares, feelings of helplessness, flashbacks, and post-traumatic stress disorder. 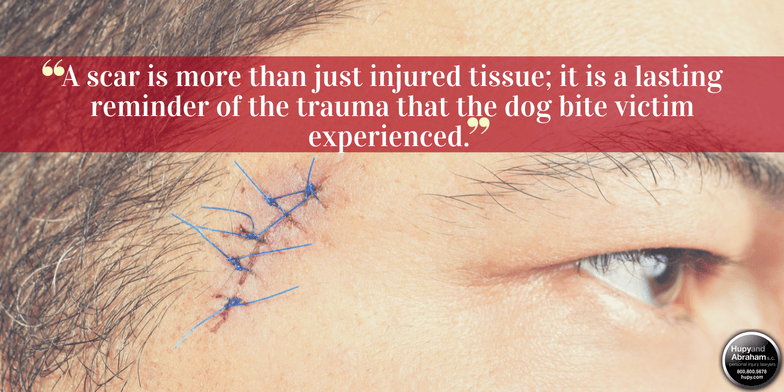 A scar is more than just injured tissue; it is a lasting reminder of the trauma that the dog bite victim experienced. While surgical techniques can reduce scar tissue, some scars can never be completely removed. For a dog bite victim, a scar may be a constant reminder of the pain of a dog bite attack, and it may be a source of embarrassment. A scar can make a once outgoing person avoid others. It can eat at one’s self-confidence, it can affect how a person is perceived both socially and at work, and it can be a significant part of a dog bite victim’s damages. The location of the scar. For example, a scar on your face that is easily noticeable by others may be worth more than a scar on your leg that is hidden by your clothing, because it may have a greater impact on your life. The size and appearance of the scar. Your age. Children may be able to recover more than older people, for example. The medical treatment you require. Your physical and emotional suffering. Your attorney can help you understand how these factors may apply to the specific injury you have suffered and help you fight for your recovery. You deserve to get a fair and just recovery after a Milwaukee dog bite scar injury. Please contact our experienced dog bite personal injury lawyers today at 1-800-800-5678 for more information and to schedule a free consultation.